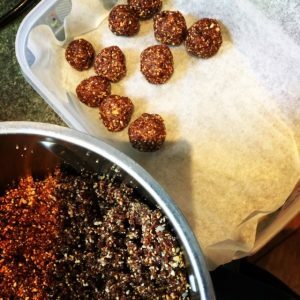 I love this recipe, it is a great snack for when I am craving something sweet and since it is sugar free it is great for my health. I also find that they fill me up, so I don’t have to eat heaps of them to satisfy that craving. I make these for family and friends as Christmas gifts and after all the indulgent food they have eaten, they are thankful for something healthy and yummy at the same time. They look fantastic inside a small colourful bowl, wrapped in cellophane and tied with Christmas ribbon. I usually double the recipe so there is enough for everyone. Makes about 30 small balls. Place the nuts into a food processor and blend until they are finely ground. Add the dates, chia seeds, cocoa powder, coconut oil and orange zest and blend until the mixture is completely combined and holds together when you press a chunk together. Roll into large teaspoon sized balls using your hands, then place in the fridge to cool for 30 mins-1 hour. I store these in the fridge in an airtight container and they last for a week or so. Walnuts are great for the kidneys and if you are trying to conceive, they are especially beneficial for men!